Never let play time be boring again with this posable Darth Vader action figure. Your child can move this Sith lord’s action figure so he looks just like he did in the Star Wars movies. Don’t forget to place his lightsaber in his hand so he’s ready for battle. Purchase includes one, 6” Darth Vader figure, commemorating Star Wars’ 40th anniversary, and his lightsaber. Vader makes for a great stocking stuffer or general holiday present. Kids and fans alike can imagine the biggest battles and missions in the Star Wars saga with figures from The Black Series! With exquisite features and decoration, this series embodies the quality and realism that Star Wars devotees love. Celebrate 40 incredible years of Star Wars action and adventure with vintage Star Wars figures, featuring classic design and packaging! Since 1977, Star Wars has captured the hearts of millions with iconic characters, impressive vehicles, and a galaxy of stories that has passed the test of time over and over again. Celebrate the legacy of Star Wars with 40th anniversary 6-inch figures from the Black Series! 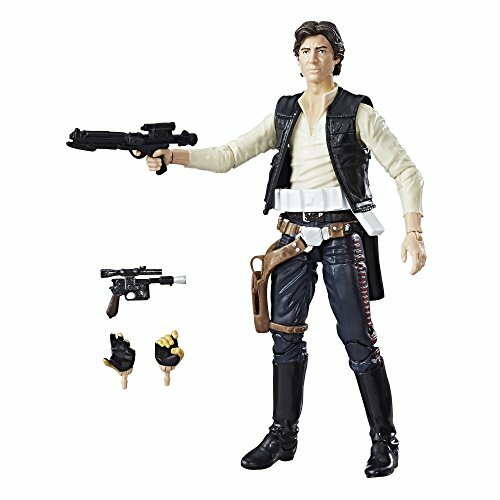 Recall moments of intense battle with this Star Wars Black Series 40th Anniversary 6-inch Han Solo figure that includes Han’s signature blaster and other character-inspired accessories, and features premium deco across multiple points of articulation. Star Wars products are produced by Hasbro under license from Lucasfilm Ltd. Hasbro and all related terms are trademarks of Hasbro. Kids and fans alike can imagine the biggest battles and missions in the Star Wars saga with figures from The Black Series! 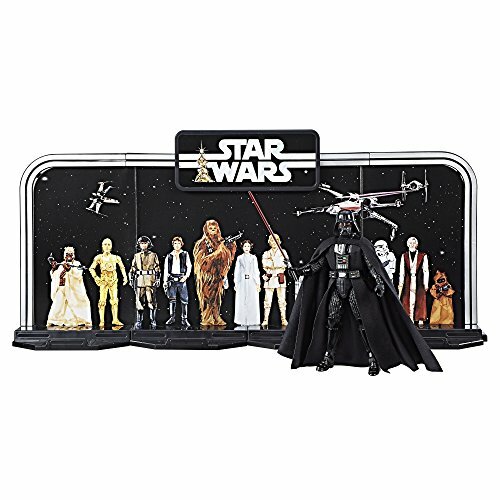 With exquisite features and decoration, this series embodies the quality and realism that Star Wars devotees love.Celebrate 40 incredible years of Star Wars action and adventure with vintage Star Wars figures, featuring classic design and packaging! Since 1977, Star Wars has captured the hearts of millions with iconic characters, impressive vehicles, and a galaxy of stories that has passed the test of time over and over again. Celebrate the legacy of Star Wars with 40th anniversary 6-inch figures from the Black Series! 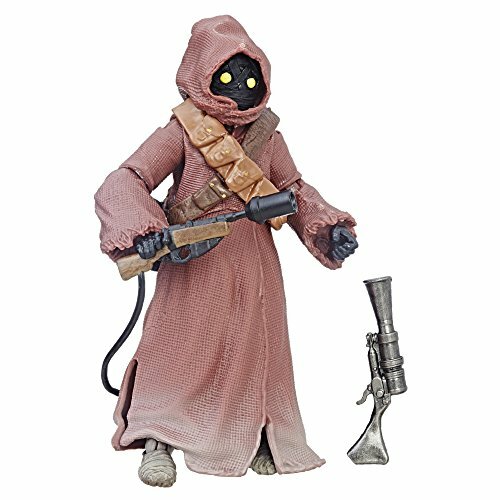 Recall moments of intense battle with this Star Wars Black Series 40th Anniversary 6-inch Jawa figure that features premium deco across multiple points of articulation. Star Wars products are produced by Hasbro under license from Lucasfilm Ltd.Hasbro and all related terms are trademarks of Hasbro. Kids and fans alike can imagine the biggest battles and missions in the Star Wars saga with figures from The Black Series! With exquisite features and decoration, this series embodies the quality and realism that Star Wars devotees love. Celebrate 40 incredible years of Star Wars action and adventure with vintage Star Wars figures, featuring classic design and packaging! Since 1977, Star Wars has captured the hearts of millions with iconic characters, impressive vehicles, and a galaxy of stories that has passed the test of time over and over again. Celebrate the legacy of Star Wars with 40th anniversary 5.25-inch figures from the Black Series! 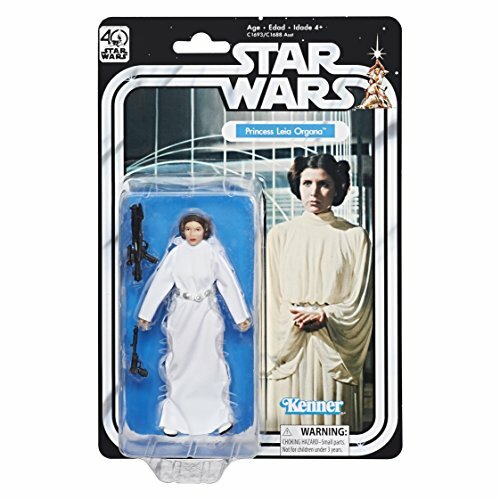 Recall moments of intense battle with this Star Wars Black Series 40th Anniversary 5.25-inch Princess Leia Organa figure that includes character-inspired accessories and features premium deco across multiple points of articulation. Star Wars products are produced by Hasbro under license from Lucasfilm Ltd. Hasbro and all related terms are trademarks of Hasbro. Kids and fans alike can imagine the biggest battles and missions in the Star Wars saga with figures from The Black Series! With exquisite features and decoration, this series embodies the quality and realism that Star Wars devotees love. Celebrate 40 incredible years of Star Wars action and adventure with vintage Star Wars figures, featuring classic design and packaging! Since 1977, Star Wars has captured the hearts of millions with iconic characters, impressive vehicles, and a galaxy of stories that has passed the test of time over and over again. Celebrate the legacy of Star Wars with 40th anniversary 6-inch figures from the Black Series! 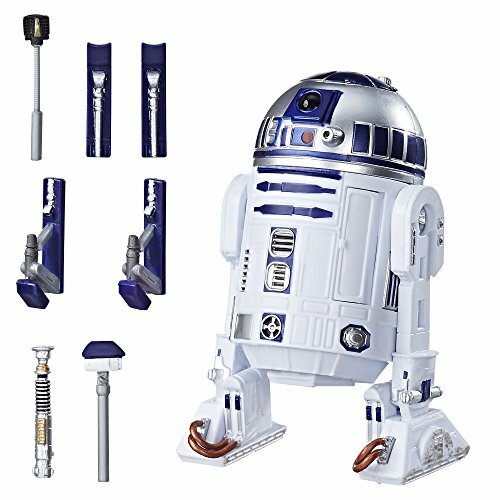 Recall moments of intense battle with this Star Wars Black Series 40th Anniversary 6-inch-scale Artoo-Detoo (R2-D2) figure that includes character-inspired accessories and features premium deco across multiple points of articulation. Star Wars products are produced by Hasbro under license from Lucasfilm Ltd. Hasbro and all related terms are trademarks of Hasbro. Kids and fans alike can imagine the biggest battles and missions in the Star Wars saga with figures from The Black Series! With exquisite features and decoration, this series embodies the quality and realism that Star Wars devotees love.Celebrate 40 incredible years of Star Wars action and adventure with vintage Star Wars figures, featuring classic design and packaging! Since 1977, Star Wars has captured the hearts of millions with iconic characters, impressive vehicles, and a galaxy of stories that has passed the test of time over and over again. Celebrate the legacy of Star Wars with 40th anniversary 6-inch figures from the Black Series! 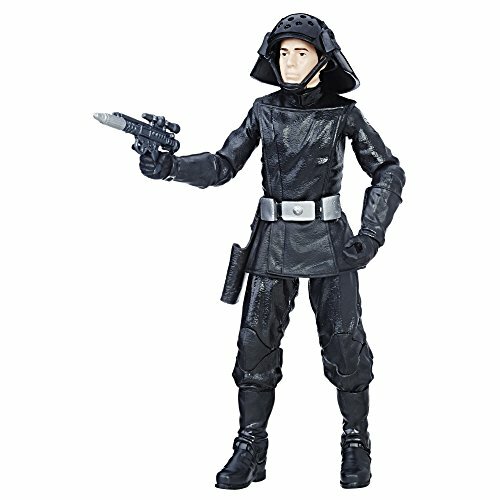 Recall moments of intense battle with this Star Wars Black Series 40th Anniversary 6-inch Death Squad Commander figure that features premium deco across multiple points of articulation. Star Wars products are produced by Hasbro under license from Lucasfilm Ltd.Hasbro and all related terms are trademarks of Hasbro. Kids and fans alike can imagine the biggest battles and missions in the Star Wars saga with figures from The Black Series! With exquisite features and decoration, this series embodies the quality and realism that Star Wars devotees love. 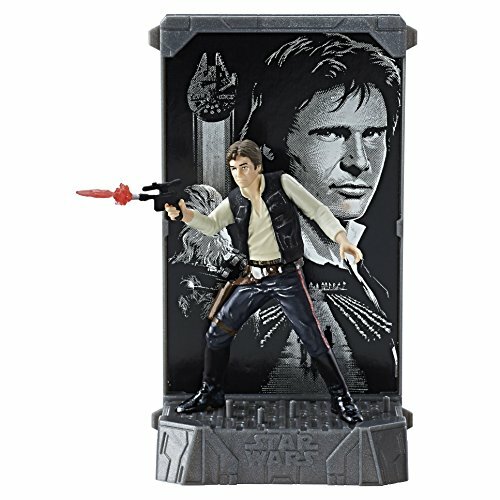 Inspired by the 40th Anniversary of Star Wars: A New Hope, this Han Solo figure, like all die-cast figures from the Titanium Series, features impeccable movie-real design and incredible detail. 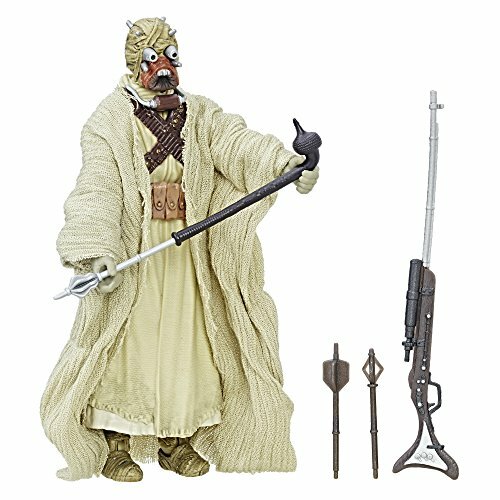 Each figure also includes a character-inspired base and reversible backdrop, as well as character-specific accessories, so kids and collectors can recreate iconic moments from Star Wars. No collection is complete without these die-cast figures from the Titanium Series and the incredible Star Wars universe!Each sold separately. Star Wars products are produced by Hasbro under license from Lucasfilm Ltd. Hasbro and all related terms are trademarks of Hasbro. Kids and fans alike can imagine the biggest battles and missions in the Star Wars saga with figures from The Black Series! With exquisite features and decoration, this series embodies the quality and realism that Star Wars devotees love.Celebrate 40 incredible years of Star Wars action and adventure with vintage Star Wars figures, featuring classic design and packaging! Since 1977, Star Wars has captured the hearts of millions with iconic characters, impressive vehicles, and a galaxy of stories that has passed the test of time over and over again. Celebrate the legacy of Star Wars with 40th anniversary 6-inch figures from the Black Series! 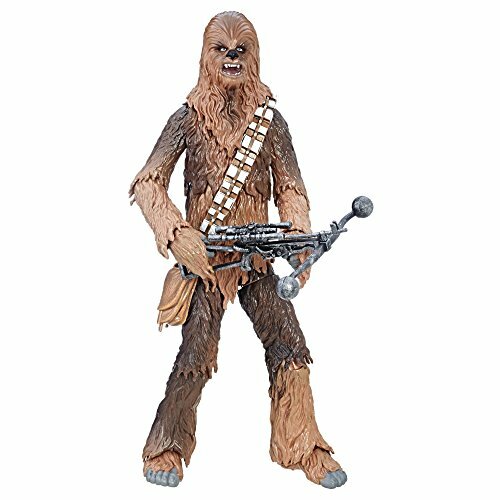 Recall moments of intense battle with this Star Wars Black Series 40th Anniversary 6-inch-scale Chewbacca figure that includes Chewie’s bowcaster and features premium deco across multiple points of articulation. Star Wars products are produced by Hasbro under license from Lucasfilm Ltd.Hasbro and all related terms are trademarks of Hasbro. Kids and fans alike can imagine the biggest battles and missions in the Star Wars saga with figures from The Black Series! With exquisite features and decoration, this series embodies the quality and realism that Star Wars devotees love.Celebrate 40 incredible years of Star Wars action and adventure with vintage Star Wars figures, featuring classic design and packaging! Since 1977, Star Wars has captured the hearts of millions with iconic characters, impressive vehicles, and a galaxy of stories that has passed the test of time over and over again. Celebrate the legacy of Star Wars with 40th anniversary 6-inch figures from the Black Series! 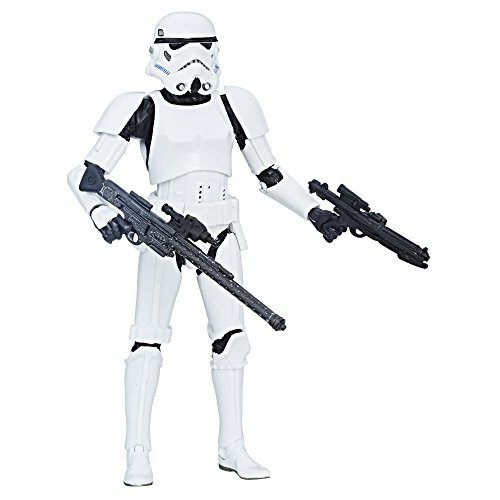 Recall moments of intense battle with this Star Wars Black Series 40th Anniversary 6-inch Stormtrooper figure that includes character-inspired accessories and features premium deco across multiple points of articulation. Star Wars products are produced by Hasbro under license from Lucasfilm Ltd.Hasbro and all related terms are trademarks of Hasbro.